1Programa de Pós Graduação em Zootecnia, Universidade Federal de Mato Grosso, Campus de Sinop. Avenida Alexandre Ferronato Nº 1.200, Setor Industrial CEP 78557-267, Sinop, MT, Brasil. 2Universidade Federal de Mato Grosso do Sul, Av. Senador Filinto Müller Nº 2443 - Caixa Postal 549, Bairro Vila Ipiranga, CEP 79070-900, Campo Grande, MS, Brasil. 3Universidade Federal de São João Del Rei, Departamento de Zootecnia. Praça Frei Orlando, 170, Centro, CEP 36307-352, São João Del- Rei, MG, Brasil. 4Universidade Federal de Lavras, Campus Universitário, Caixa Postal 3037, CEP: 37200-000, Lavras, MG, Brasil. Ractopamine (RAC) supplementation in the feed has been evaluated as a strategy to increase productive efficiency in finishing pigs. To evaluate the effects of different RAC dietary levels on performance, carcass traits, efficiency of lysine (ELU) and energy (EEU) utilization, and economic viability in finishing pig. A total of 40 barrows (74.75 ± 5.22 kg) were fed four RAC levels (0, 5, 10 and 5-10 mg/kg step-up program) from 0-14, 15-31 and 0-31 days. Performance, carcass characteristics, ELU, EEU, cost per unit of weight gain (CWG), payment and profit parameters were measured. The animals were distributed in a completely randomized design in four treatments, with ten replicates per treatment. The experimental unit was each animal. Pigs fed RAC diets showed increased body weights at 14 and 31 days, average daily gain (ADG) at 0-14 and 0-31 days, ELU at 0-14 days, and hot carcass weight as compared with those fed the control diet. The step-up program as compared to the 10 mg/kg RAC concentration resulted in increased body weight, feed/gain ratio (FGR), ADG, ELU, EEU and CWG at 0-14 days. Payment by weight and bonus payment were better for treatments with RAC as compared to control. Pigs fed RAC improved performance, carcass weight, ELU, EEU and economic viability. The results were better for the step-up program compared with the intermittent use of 10 mg/kg RAC. Key words: beta-adrenergic agonist; carcass quality; economy; lysine; pig nutrition. La suplementación de cerdos con ractopamina (RAC) es una estrategia para aumentar la eficiencia productiva en ceba. Evaluar el efecto de diferentes planes de suplementación con RAC en dietas de cerdos en ceba sobre el rendimiento productivo, características de la canal, eficiencia de utilización de lisina (ELU) y energía (EEU), y viabilidad económica. Un total de 40 machos castrados (74,75 ± 5,22 kg) fueron alimentados con cuatro niveles de RAC (0, 5, 10 y 5-10 mg/kg de plano escalonado) de 0-14, 15-31 y 0-31 días. Se evaluó el rendimiento, características de la canal, ELU, EEU, el costo por unidad de ganancia de peso (CWG), los tipos de pago y ganancias. Los animales se distribuyeron en un diseño completamente aleatorizado en cuatro tratamientos, con diez repeticiones por tratamiento. La unidad experimental fue cada animal. Los animales suplementados con RAC tuvieron mayor peso corporal a los 14 y 31 días, ganancia de peso diaria (ADG) de 0-14 y 0-31 días, ELU de 0-14 días y peso de la canal caliente en comparación con el grupo control. En comparación con la concentración de 10 mg/kg de RAC, el plano escalonado resultó en un aumento de peso corporal, conversión alimenticia (FGR), ADG, ELU, EEU y CWG a los 0-14 días. El pago por peso y el pago por bonificación fueron mejores para los tratamientos con RAC en comparación con el control. Los cerdos en ceba alimentados con RAC tienen mejor rendimiento, peso de la canal, ELU, EEU y viabilidad económica. Los resultados de los parámetros estudiados son mejores con el uso del plano escalonado en comparación con el uso continuo de 10 mg/kg de RAC. Palabras-clave: agonista beta-adrenérgico; calidad de la canal; economía; lisina; nutrición de cerdos. Suplementação de ractopamina (RAC) em dietas para suínos foi avaliada como uma estratégia para aumentar eficiência de produção de suínos em terminação. Avaliar os efeitos de diferentes planos de suplementação de RAC em dietas para suínos em terminação sobre o desempenho, características de carcaça, eficiência de utilização de lisina (ELU) e energia (EEU), e viabilidade econômica. Um total de 40 machos castrados (74.75 ± 5.22 kg) foram alimentados com quatro níveis de RAC (0, 5, 10 e 5-10 mg/kg plano escalonado) em 0-14, 15-31 e 0-31 dias. Desempenho, características de carcaça, ELU, EEU, custo por unidade de ganho de peso (CWG), tipos de pagamento e lucro foram mensurados. Os animais foram distribuídos em um delineamento inteiramente casualizado em quatro tratamentos, dez repetições para cada tratamento. A unidade experimental foi cada animal. Os animais alimentados com dietas contendo RAC mostraram aumento de peso corporal aos 14 e 31 dias, ganho de peso diário (ADG) de 0-14 e 0-31 dias, ELU de 0-14 dias e peso de carcaça quente comparado ao grupo controle. O plano escalonado comparado ao nível de 10 mg/kg de RAC mostrou maior peso corporal, conversão alimentar (FGR), ADG, ELU, EEU e CWG de 0-14 dias. Pagamento por peso e pagamento por bonificação foram melhor para tratamentos com RAC em comparação ao controle. Suínos alimentados com RAC mostram melhor desempenho, peso de carcaça, ELU, EEU e viabilidade econômica. Os resultados dos parâmetros estudados foram melhores com uso do plano escalonado quando comparado com uso constante de 10 mg/kg de RAC para suínos em terminação. Palavras-Chave: agonista beta-adrenérgico; economia; lisina; nutrição de suínos; qualidade de carcaça. Ractopamine (RAC) is a β-adrenergic agonist feed additive that increases the efficiency of pork production (Carr et al., 2008) by improving carcass leanness. This substance acts on the β-adrenergic receptors of muscle cells increasing the diameter of the fibers, and thereby, the muscle mass. In adipocyte cells, RAC acts by catalyzing the breakdown of triglycerides, inhibiting lipogenesis and stimulating lipolysis (Mills, 2002), consequently reducing fat deposition. Overall, RAC has shown to maximize protein deposition without changing meat quality standards such as color, marbling, firmness or pH (Kiefer and Sanches, 2009). Animal response to RAC varies according to several aspects; e.g., level of dietary supplementation (Corassa et al., 2010), feeding duration (Oliveira et al., 2013; Almeida et al., 2013), and nutritional level (Marinho et al., 2007). The effects of feeding duration and supplementation level have been discussed in terms of the stimuli-dependent and desensitization of receptor responses (Moody et al., 2000). Ractopamine is typically recommended for pigs in the finishing phase within 5 to 20 mg/kg range (Brazil, 2010) during the last 3 to 5 weeks before slaughter (Amim et al., 2014). After four weeks of dietary RAC supplementation, a reduced intensity of the response due to down-regulation and desensitization of receptors has been reported (Armstrong et al., 2004). One way to minimize the reduction of RAC response is by increasing the dosage after two weeks of supplementation (Moody, 2000); this supplementation strategy is known as step- up. Dietary levels of digestible lysine and metabolizable energy influence performance and carcass characteristics of finishing pigs (Andretta et al., 2011), so knowledge about the efficiency of these nutritional factors as a function of RAC levels could affect the viability of this additive. Therefore, the hypothesis tested in the present study was that a RAC step-up feeding program could improve performance and carcass leanness in finishing pigs compared to diets without RAC or with only one level of RAC. Therefore, the objective of this study was to evaluate the effects of different RAC feeding levels on performance, carcass traits, efficiency of lysine (ELU) and energy utilization (EEU), and economic viability of finishing pigs. The study was conducted at Campus Universitário de Sinop, Universidade Federal de Mato Grosso, Brazil, following ethical principles for animal experimentation adopted by the National Council for Animal Experimentation Control, approved by the Ethics Committee on Animal Use of Universidade Federal de Mato Grosso (protocol n. 23108.700673/14-4). The trial site is located at 12°36ʹ77.20”S latitude and 56°74’75.70”W longitude. Commercial hybrid barrows (n = 40) of high genetic potential for lean gain, single genetic origin (Agroceres PIC®), with 74.75 ± 5.22 kg initial bodyweight were used. The animals were distributed in a completely randomized design into four treatments and ten replicates per treatment. The treatments were as follow: control (basal diet without RAC for 31 d); 5 mg kg-1 (basal diet supplemented with 5 mg/kg RAC for 31 d); 10 mg/kg (basal diet with 10 mg/kg RAC during 31 d); and step-up (basal diet with 5 mg/kg RAC during 14 d followed of basal diet with 10 mg/kg RAC during 15 to 31 d). Pigs were fed dietary treatments and water ad libitum. Basal isoenergetic and isonitrogenous diets were formulated based on corn and soybean meal (Table 1) to meet the minimum recommendations proposed in the food composition tables and nutritional requirements of Rostagno et al. (2011). The animals were housed in a shed (3.40 m height) with concrete floor. The trial lasted 31 days, and the animals were weighed, and their feed intake and leftovers were measured at the beginning, on the fourteenth day and at the end of the trial for economic and performance evaluations. Pig performance was evaluated through average daily feed intake (ADFI), average daily gain (ADG), and feed/gain ratio (FGR) at 0, 14th and 31th days, by weighing the animals as well as feed leftovers. Animal performance data were used to calculate efficiency of lysine (ELU, g/kg) and energy (EEU, Mcal/kg) utilization obtained for daily lysine (g), or energy (Mcal) intake divided by daily weight gain. At the end of the trial, all animals were identified with tattoos, fasted of feed for 12 h and then transported to the slaughterhouse (450 km in about 6 h). Animals were stunned before slaughter. The carcasses were washed, weighted, split along the dorsal midline and then cooled to 7°C for 24 h, according to the Brazilian Carcass Classification Method (ABCS, 1973). Loin eye area (LEA), loin depth (LD) and backfat thickness (BT) were measured. The LEA assessment followed methodology by Boggs and Merkel (1979) using the section between the 10th and 11th ribs of the left half- side. The outline of the Longissimus dorsi muscle was drawn on transparent acetates for subsequent determination of the area using the AutoCAD program. The LD was measured directly in the same section of the muscle represented by an imaginary line, corresponding to the largest diameter of the exposed surface of the muscle. The BT was measured in the same section of the muscle used to determine LEA, perpendicular to the skin, but excluding it. Both measurements were taken with a caliper. Yi: FC/kg weight gain of pigs in the ith treatment. Pi: price/kg feed in the ith treatment. Qi: quantity of feed consumed in the ith treatment. Gi: weight gain of pigs in the ith treatment. Table 1 Calculated composition of the experimental diets (g/kg). 1Composition per kg of diet: Cu (8,0 mg), Fe (25,8 mg), Zn (82 mg), Mn (24 mg), Se (0,22 mg), I (0,66 mg), Co (8 mg), cholin (120 mg), vitamin A (2,960 IU), vitamin D3 (740 IU), vitamin E (5,365 IU), vitamin K3 (0.37 mg), nicotinicacid (8,87mg), pantothenicacid (5,44 mg), folicacid (0,22 mg), biotin (0,018 mg), thiamin (0,74 mg), riboflavin (2.07 mg), pyridoxine (0.74 mg), cyanocobalamin (11 µg), phytase (500 FTU), zinc-bacitracin (55 mg). 2Composition per kg of diet:digestible lysine (1.344 g), digestible methionine (0.192 g),digestible threonine (0.081 g). 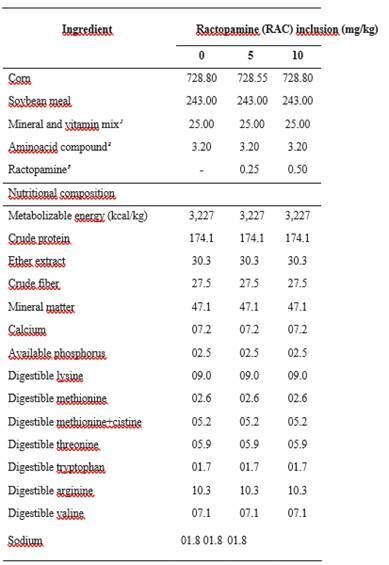 3Composition per kg of product: ractopamine hydrochloride 20 g.
Dietary cost/kg of ingredients were: corn (R$ 0.25), soybean meal (R$ 1.15), mineral and vitamin mix (R$ 1.70), amino acid mixture (R$ 5.67), ractopamine (R$ 55.00). Costs/kg of feed were: basal (R$ 0.5221), 5 mg/kg (R$ 0.5357) and 10 mg/kg (R$ 0.5495). At the end, values of economic analysis were converted to US dollars, considering R$3.00 = US$ 1.00. Data was submitted to analysis of variance using the GLM procedure of SAS® software, version 6 (SAS Institute, Inc., Cary, NC, USA) (2001), using the initial weight as covariate and the mean decomposed factors into orthogonal contrasts: i) without-RAC versus with-RAC, ii) 5 mg/kg versus 10 mg/kg RAC, and; iii) 10 mg/kg versus 5-10 mg/kg (step-up) RAC. Differences between levels of fixed effects were considered significant (p≤0.05), or tendency (p<0.10). The pigs supplemented with different RAC levels showed increased (p<0.05) weight at 14 and 31 days (last day), as well as ADG form 0-14 days, and 0-31 days of the trial, compared to those in the control group (Table 2). Dietary inclusion of RAC showed no effect on weight gain only within 15-31 days. The RAC did not influence (p>0.10) ADFI in comparison to the control group. Feed gain ratio (FGR) of pigs fed RAC showed a tendency for better results in the 0-14 (p=0.07), and 0-31 days (p=0.09). No difference was observed in performance (p>0.10) of pigs fed 5 or 10 mg/kg RAC. The step-up RAC program resulted in better (p<0.05) weight, ADG and FGR in the 0-14 days compared to 10 mg/kg RAC. In addition, the step-up showed tendencies of increased weight (p= 0.09) for ADG (p= 0.09) and FGR (p= 0.08) in the 0-31 days. The ELU during 0-14 days was higher (p<0.05) in pigs fed RAC compared to the control treatment (Table 3). No difference was noted in ELU with respect to 5 to 10 mg/kg RAC treatments. The step-up program improved (p<0.05) ELU during 0-14, and 0-31 days in comparison to 10 mg/kg RAC. Similarly, EEU during 0-14 days showed a tendency (p= 0.07) to improve in pigs fed RAC compared to the control. No difference was observed in EEU with respect to 5 to 10 mg/kg RAC. The step-up program improved (p<0.05) EEU during 0-14 days in comparison to 10 mg/kg RAC. The other parameters were not affected by RAC. The RAC increased hot carcass weight (p<0.05) and tended (p= 0.09) to increase LEA compared with the control animals (Table 4). The BT, LD, carcass lean percentage, carcass lean amount and bonus payment were not influenced by RAC (p>0.10). Comparison between 5 versus 10 mg/kg RAC, and 10 versus 5-10 mg/kg RAC had no effects on carcass traits (p>0.10). A tendency for a greater carcass weight in pigs fed the step-up program (p= 0.09) was observed in comparison with those fed 10 mg/kg RAC (Table 4). The other carcass parameters were not influenced by the treatments. The PAYWEIGHT and PAYBON were higher for pigs fed RAC compared to the controls, with a tendency (p= 0.09) for improved PROFITWEIGHT (Table 5). No difference was observed in economic viability comparing treatments with 5 or 10 mg/kg RAC. The cost per unit of weight gain (CWG) in pigs fed 5-10 mg/kg RAC (step-up) was lower (p< 0.05) in comparison to those fed 10 mg/kg RAC during 0-14 and 0-31 days. In addition, a tendency for improvement was noted for PAYWEIGHT (p= 0.09), PAYBON (p= 0.09), PROFITWEIGHT (p= 0.07), and PROFITBON (p= 0.08) in the step-up program. Table 2 Performance of finishing pigs supplemented with Ractopamine (RAC). 1ADFI: average daily feed intake; ADG: average daily gain; FGR: feed/gain ratio. Table 3 Efficiency of lysine (ELU) and energy utilization (EEU) of finishing pigs supplemented with Ractopamine (RAC). Table 4 Carcass traits of finishing pigs supplemented with Ractopamine (RAC). Table 5 Cost per unit of weight gain (CWG), payment, and profit of finishing pigs supplemented with Ractopamine (RAC). PAYWEIGHT: revenue obtained by the payment of each animal per weight; PAYBON: revenue obtained by the sale of each animal per weight adding the bonus index; PROFITWEIGHT: profit, considering the PAYWEIGHT; PROFITBON: profit, considering the PAYBON. Improvement in weight and ADG in pigs fed RAC is related to the mode of action of this substance, which increases muscle, minimizing fat deposition. This effect was also reported by Marinho et al. (2007), and Cantarelli et al. (2009) with improved final weight, ADG and FGR of pigs with RAC supplementation, in addition to improved carcass characteristics by reducing BT and increasing deposition rate of lean meat. Reviewing data on the use of RAC, Andretta et al. (2011) reported that RAC increased 14 and 11% the values of observed and calculated FGR, respectively. Similarly, Almeida et al. (2013), evaluating different feeding periods using 10 mg/kg RAC, observed no effect of RAC on ADFI, nor on backfat measurements. The lack of RAC effect on feed intake could be due to the fact that the levels proposed in this study were not sufficient to influence this parameter. In contrast, Crome et al. (1996) observed decreased feed intake when higher dietary RAC levels were used. On the other hand, no influence of up to 20 mg/kg RAC on ADFI was reported in the study of Kiefer and Sanches (2009). A similarity of responses between the two RAC levels (5 mg/kg versus 10 mg/kg) contradict a previous study by Marinho et al. (2007), which evidenced differences, represented by the classical dose-dependent response. Corassa et al. (2013) reported that deficiency in lysine using RAC can limit animal response, as this amino acid is highly relevant for protein synthesis, and available lysine affects pig performance. Therefore, the performance of animals fed 10 mg/kg could have been limited by the dietary lysine level. In this sense, Rostagno et al. (2011) suggest using different lysine levels as a function of dietary RAC concentration, which was not considered in this study. Our findings are inconsistent with other studies comparing the step-up program versus control. Poletto et al. 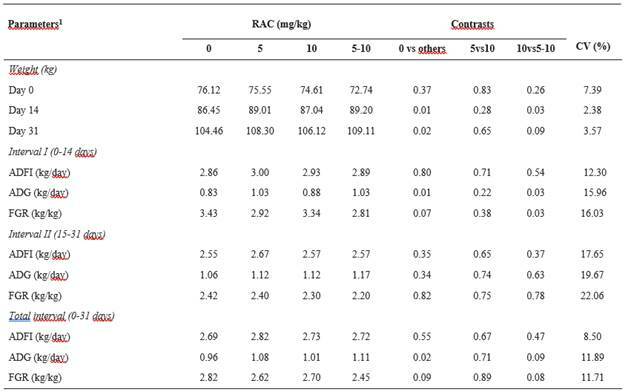 (2009) showed that results from the first 2 weeks of the study, when RAC was fed at 5 mg/kg did not show differences in growth performance between control and RAC animals, but when the RAC level was increased to 10 mg/kg, RAC-fed animals had greater ADG, G:F, and BW at d 28 compared to the control pigs. In the study by Rikard-Bell et al. (2009), the step-up reduced ADFI during 0-14 days increased ADG in the 15-31, and 0-31 days, improved G:F and body weight at 31 days, in addition to improved carcass weight, carcass lean amount and percentage. Garbossa et al. (2013) evaluated 0 to 20 mg/kg RAC, observing a linear increase in final weight with increasing RAC levels, as well as in average daily weight gain. Interestingly, they registered improvement in feed conversion with optimal level for 5 mg/kg, with no effect on intake of digestible lysine and energy. The responses recorded for the step-up program in the present study confirm the ability of the animals to enhance the mode of action of the additive, as evidenced by an increase in stimulation of cell receptors (Armstrong et al., 2004), suggesting that the step-up program may give better results than the continued use of a single high concentration. Efficiency in lysine and energy utilization results are related to RAC mode of action, which enhances tissue protein accretion at the expense of adipose tissue. In turn, pigs fed RAC require optimization of lysine intake and dietary energy content. As lysine is the first limiting amino acid for pigs, lysine inclusion should be increased in diets containing RAC. Moreover, adjustments of the other amino acids as a function of lysine should be considered in the formulation of these diets (Yen et al., 1990). Accordingly, Ferreira (2014) also demonstrated improved efficiencies of lysine and energy utilization in diets containing RAC in comparison with a control diet. Improved nutrient utilization by RAC- fed animals is in line with higher body weight, carcass weight and weight gain, due to increased protein synthesis and partial lipogenesis blockade, characteristic of RAC mode of action (Schinckel et al., 2003), due to gain variations (fat, lean, and bone) and maintenance requirements influencing energy conversion (Patience et al., 2015). The increase in carcass weight results from the increased weight of the animals at the end of the experimental period. The influence of RAC use on carcass traits remains unclear; Pereira et al. (2008) reported improvement in some parameters, including those evaluated in this study, while Marinho et al. (2007) and Sanchez et al. (2010) reported no effect. The RAC levels used in this study may not have been sufficient to express the effects on carcass traits, since Corassa et al. (2010) showed that lower levels of RAC usually improve performance, while higher levels improve carcass characteristics. The results of animal weight and carcass traits in the step-up programs compared to 10 mg/kg RAC agree with those by Ferreira (2014), but they differ compared to those by Corassa et al. (2010). Diets without RAC usually have lower amino acid and energy levels than RAC diets (Rostagno et al., 2011), possibly generating lower financial cost and performance, and impacting the cost per unit of gain. However, in the present study, no difference was observed among diets with the same nutritional levels. The PAYWEIGHT and PAYBON were higher for animals fed RAC as compared with those not fed RAC because animals had increased final body weight, which has a direct impact on the final sale value. In conclusion, RAC use and the step-up program improve performance parameters, carcass composition and economic viability of finishing pigs. *Corresponding author: Anderson Corassa. Programa de Pós Graduação em Zootecnia, Universidade Federal de Mato Grosso, Campus de Sinop. Avenida Alexandre Ferronato Nº 1.200, Setor Industrial CEP 78557-267, Sinop, MT, Brasil. Tel. : +55 66 98423-5671. E-mail: anderson_corassa@ufmt.br.